Who isn’t attracted to the magical glow of gold? On a woman's face, gold looks fascinating. 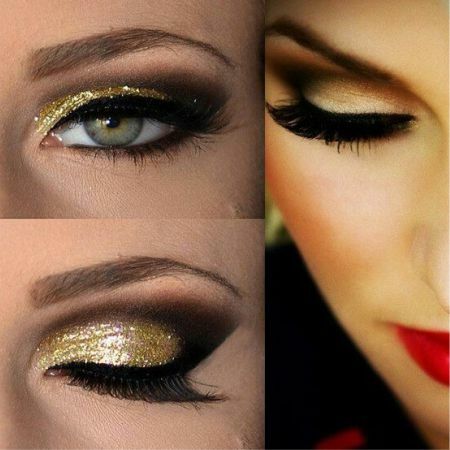 Makeup in golden shades is the best choice for any special occasion. But you can also wear a simpler variant of this shade during the day, in a normal, business-like atmosphere. Who Should Avoid Golden Shades? ★ Those over the age of 45. These restrictions apply due to the fact that golden eyeshadows highlight all types of flaws, including wrinkles and unevenness. In addition, this is quite a controversial makeup look for blondes with fair skin, although such a case should be considered individually. Golden Eye Makeup: How to Create a Makeup Look With Golden Tones? 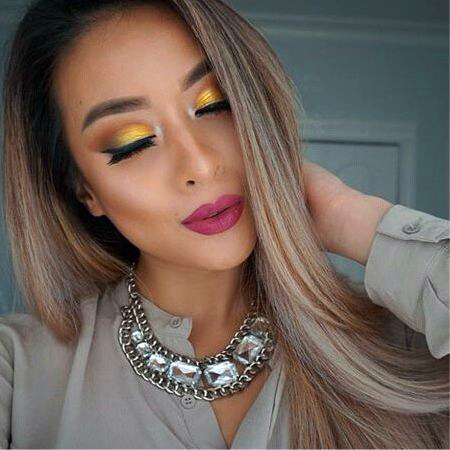 To create makeup with golden shades you need gold, black, dark purple, dark green, or dark brown eyeshadows (for an evening option), black eyeliner, and finally mascara. If you apply makeup daily, a little amount of golden eyeshadow on the entire eyelid is quite enough. 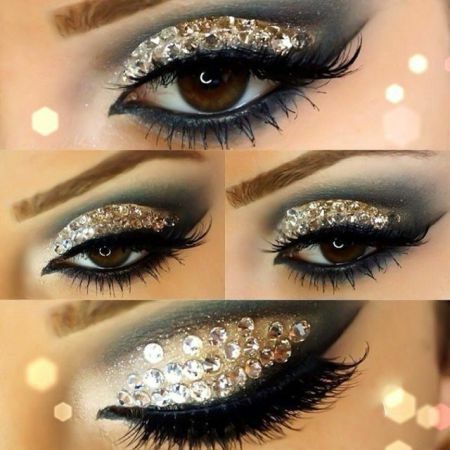 For evening makeup, apply dark eyeshadows on the inner corners of the eye and the lower half of the eyelid. Be sure to use an intense golden color in order to impress everyone with your star shine! Makeup in golden shades refreshes the face, creating a unique and stylish image. Its magical glow will add wonderful, fabulous sparkles to your eyes. For this reason, makeup in golden shades is popular among many girls. It has glamor and glitter, the echoes of oriental tales, and the flickering of distant stars. No wonder some women use only makeup in golden shades and nothing more. What is the Best Lip Color for Makeup With Golden Shades? If you want to highlight your lips, then choose bright red lipstick. If you prefer to highlight the eyes, choose an inconspicuous beige or peach lipstick which will not draw attention. A rather bold and unusual solution is to apply a little amount of concealer and powder to the lips. If you like to experiment and want to try something different, a makeup technique such as this one will surely impress others. Wearing it, you will impress everyone everywhere you go. Like the article «Makeup in Golden Shades»? Share it with friends!